MagicCamera 2.0.6 is web/video cams software developed by ShiningMorning. MaigcCamera adds a virtual camera to your system. It enables your favorite IM or video chat software to play pre-recorded videos, add funny photo frames, record webcam videos, slide show photo albums, live forward your chatting video with one friend to another, capture screen and share desktop with your friends while chatting. Furthermore, It also enables you to add lots of cool video effects to your living video on all inputs. 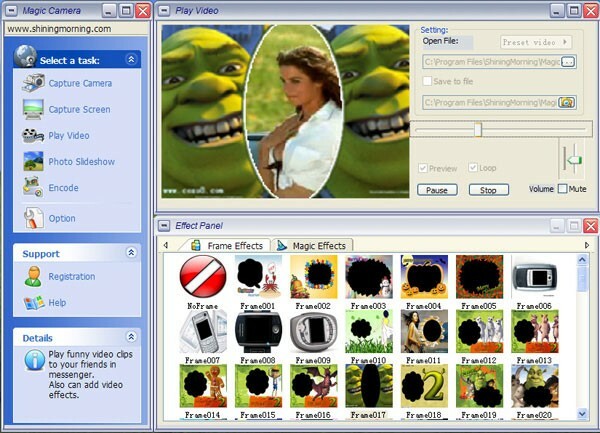 This communications software is shareware, which means you can download and use MagicCamera 2.0.6 for free during the trial period (usually for 30 days). At the expiration of the period you will have to buy the web/video cams product for $28.95. MagicCamera 2.0.6 is available at regnow and ShiningMorning website. MagicCamera 2.0.6 supports English interface languages and works with Windows XP/Vista. Latest MagicCamera 2.0.6 does not contain any spyware and/or advertise modules, allowing installing it with no worries concerning valuable information loss. Our website has thoroughly tested communications product MagicCamera 2.0.6, written the review and uploaded installation file (12617K) to our fast server. Downloading MagicCamera 2.0.6 will take several minutes if you use fast ADSL connection.